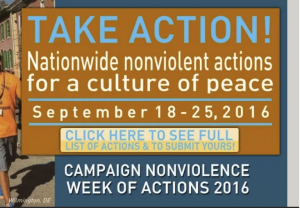 600+ Campaign Nonviolence Events Across USA Next Week!
. 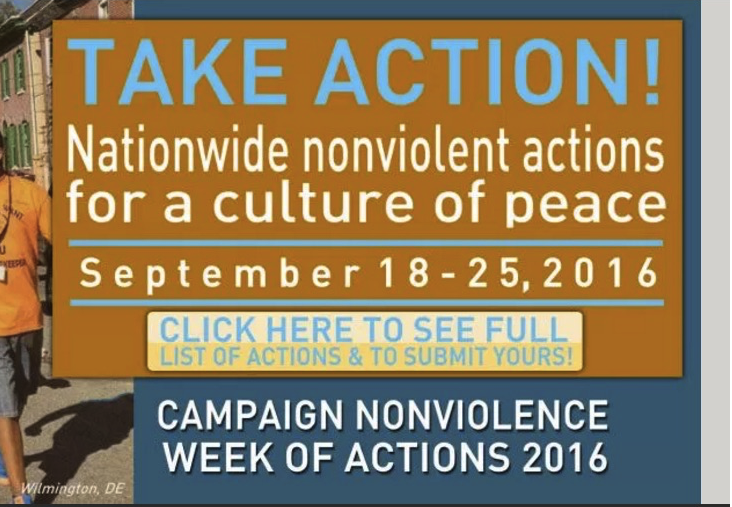 . . As the American presidential election enters its final stretch, Campaign Nonviolence seeks to forge a culture of peace and nonviolence during a year of mounting violence in America and abroad through a multitude of grassroots activism during the week of Sept. 18-26, marking International Peace Day on Sept. 21. More than 600 actions, events, marches and demonstrations in a diverse array of cities and towns are planned in each of the 50 states as well as more than a dozen foreign countries. Campaign Nonviolence began in 2014 with 230 events; 371 were staged last year. . .
—Residents will assemble in Boise, Idaho for a walk through town calling for an end to the death penalty in that state. —In Coral Springs, Florida, young people will plant trees for peace and stage a silent peace walk calling for an end to war. —Eureka, California will feature a candlelight vigil for peace and an end to racism, poverty and environmental degradation outside the Humboldt County Court House. —Honolulu, Hawaii will hold an interfaith peace service featuring traditional Hawaiian music and prayers. —Activists will walk through Los Angeles neighborhoods to campaign for the upcoming statewide vote on whether to abolish the death penalty. —In Fremont, Michigan, people will march during a community harvest parade against war, poverty, racism, environmental destruction and all forms of violence, demanding a new culture and state of nonviolence. —A weeklong effort in Wyckoff, New Jersey is being organized to welcome immigrants into the homes of neighbors for food and hospitality as a way to break down barriers and build a new inclusive culture of nonviolence. —Taos, New Mexico will hold a daylong workshop and march for young people against climate change. —People from Las Vegas, Nevada will gather in the desert at Creech Air Force Base, center for all U.S. drone warfare, to call for an end to drone bombings in Afghanistan, Pakistan, Yemen and Syria, and to demand nonviolent methods for conflict resolution. —San Antonio, Texas will host a lecture and discussion on gun violence by a leading authority. —Fond du Lac, Wisconsin will hold a daylong workshop on racism, how to confront it and creating a more welcoming, just and equal society. —Memphis, Tennessee will host an evening in conjunction with the Black Lives Matter movement featuring Rev. William Barber, head of the NAACP of North Carolina and a national voice for racial justice. “People are sick and tired of poverty, racism, police brutality, mass incarceration, hand gun violence, drone warfare, perpetual war, corporate greed, nuclear weapons, executions and environmental destruction,” said Catholic priest Rev. John Dear, a key organizer of the Sept. 18-26 movement for nonviolence and a nationally known peace activist, author of 35 books and Nobel Peace Prize nominee. “People everywhere want new leadership in the tradition of Dr. Martin Luther King, Jr. and Cesar Chavez, with a new vision for a culture of nonviolence, where we can all live in peace with justice, and be a force of good in the world—not a force of greed, war and environmental destruction. Dr. King and Cesar Chavez upheld a national and global vision of nonviolence. This month, people are taking to the streets by the thousands to demand that vision comes true. They are telling us that they are going to keep marching until this country shifts beyond its current state as presented by the media and the political candidates, and toward something new—a true nonviolent democracy where everyone lives in justice and peace” . . .